I can not believe it is December already! This year has been so crazy with its very high ups and very low downs. But before I get all sappy (I’ll save this for the 31st), I want to talk about makeup. I absolutely love to play around with makeup and see the way certain looks work or not. 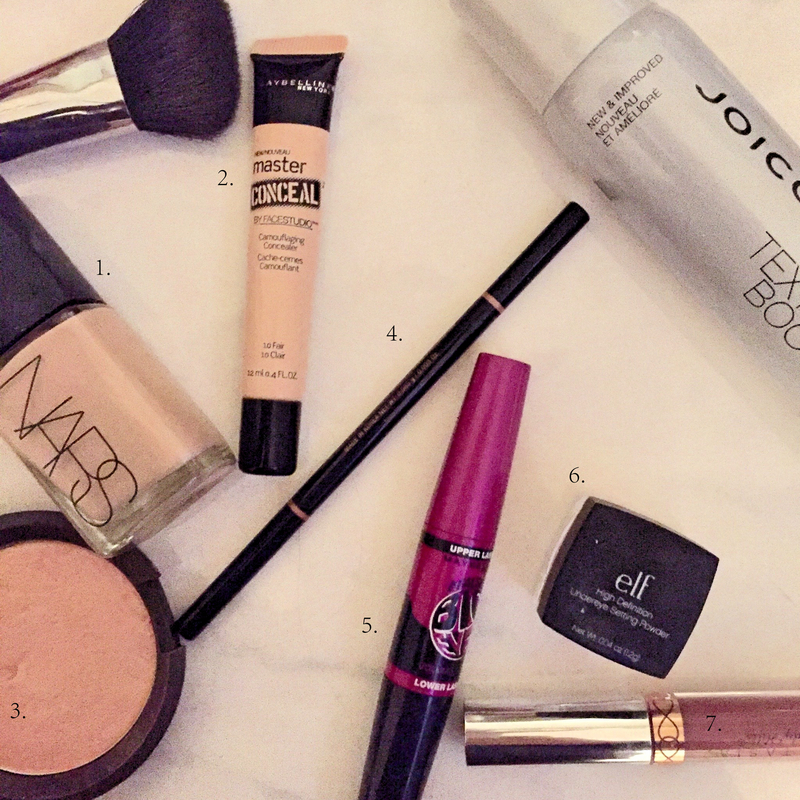 Whether it’s a dramatic smokey cat eye or quick 5 minute face, I tend to gravitate towards the same products! Here is my best attempt at capturing all of my products in one shot! 1. Lets start with the base, foundation. Over the past year my skin has been changing from normal to now pretty dry. On a shopping trip in NYC I decide to get my color IQ(which I highly recommend doing!) and explained my skin type. I picked up the Nars Sheer Glow Foundation and it has been my favorite since! 2. Got to love a good drugstore find! This concealer from Maybelline gives me life. I got the lightest shade it is was perfect for my light skin tone. It has a yellow undertone helping to reduce those late night dark circles. 3. #highlightonfleek. This is a beautiful highlighter that I can not put down! It is the Jaclyn Hill collab with Becca Cosmetics! It is so hard to describe how beautiful this highlight is, it has just the right amount of gold and in my opinion works on so many different skin tones. If you can get your hands on this, get it! Probs the only highlight you will ever need! 4. If you have brow envy, you don’t have the brow wiz from Anastasia. I have been using this product for 2 years now and it is the only brow product that gives my brow a put together yet natural look. It has a small pencil that makes it easy to draw small little lines. i get mine in the color caramel but there are more amazing colors. 5. Another drug store steal! Mascara can bring together an entire look. This mascara has been my baby. It not only makes my top eyelashes look long and full but separates my bottom lashes too! 6. This E.LF. finishing powder is a great way to set concealer. Pretty much all concealer breaks up but this powder really helps. The best part of this product is that is really inexpensive. 7. I took a picture of an Anastasia liquid lipstick in Veronica but my lip holy grail is just liquid lippies in general. Finding a brand that you like and works for your lips is really important but once you do the pay off is awesome! Thank you loves for letting me share my holy grail products!